"Do you wanna hurt me? Hurt me!" Universal has debuted the first official trailer + a poster for Angelina Jolie Pitt's By the Sea, a period romance starring Brad Pitt and of course, Angelina Jolie Pitt herself as well. The cast includes Mélanie Laurent, Melvil Poupaud, Niels Arestrup and Sarah Naudi. It was filmed around Malta, an archipelago in the central Mediterranean between Sicily and the North African coast. Truthfully, this really just seems like Pitt and Pitt – or rather Angelina and Brad – having "fun" doing a movie together where they can dress up and explore all these crazy emotions in a romantic story set in a beautiful location in the past. I'm definitely intrigued, this trailer is a very alluring tease. Take a look below. 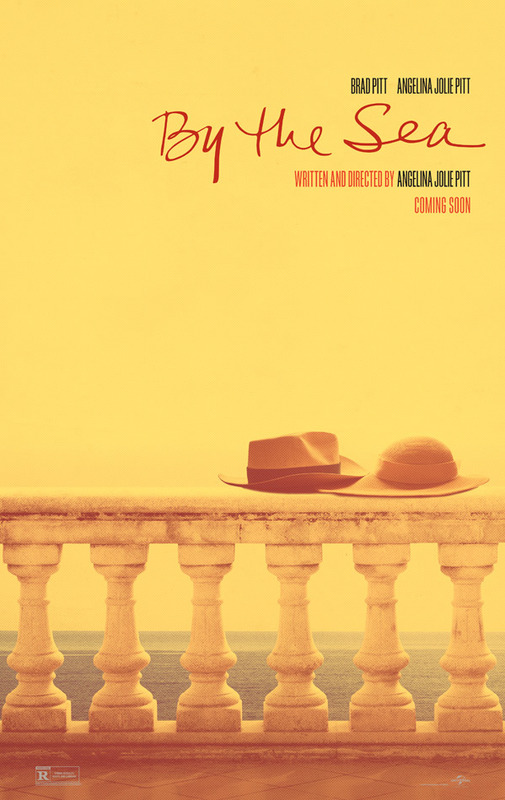 Written, directed and produced by the Angelina Jolie Pitt (In the Land of Blood and Honey, Unbroken), By The Sea follows American writer Roland (Pitt) and his wife Vanessa (Jolie Pitt), who arrive in a tranquil and picturesque seaside resort in 1970s France, their marriage in apparent crisis. As they spend time with fellow travelers, including young newlyweds Lea (Mélanie Laurent) and François (Melvil Poupaud) and village locals Michel (Niels Arestrup) and Patrice (Richard Bohringer), the couple begins to come to terms with unresolved issues in their own lives. By the Sea is inspired by European cinema and theater of the 1960s and '70s. "This is a story about a relationship derailed by loss, the tenacity of love and the path to recovery and acceptance." Universal will open Jolie Pitt's By the Sea in theaters starting November 13th. Yeeeaaah... I think I'm gonna pass on this one. Oh I'm sure there are still LOTS of people who care, but they're the same people who read Us Weekly, People Magazine, etc. I'm done with her. I was never really on the wagon anyway. I goy 3 seconds in and thought.. feck this. At least I hope they had fun making this film. Beautiful people in a beautiful place having problems. This trailer SUCKED , doesn't give a lot of what's in the movie really , so i'm still guessing about the movie !!! !